Britain's gardens are the envy of the world - from the rolling landscapes of Capability Brown, to the more formal gardens of palaces such as Hampton Court, from the quirky style of Plas Brondanw in North Wales to the informal beauty of Mount Usher in Ireland - there really is a garden for every taste. The RHS Garden Wisley in Surrey is the Royal Horticultural Society's flagship garden and boasts a world-class plant collection. Hidcote Manor in Gloucestershire is one of the most influential 20th Century gardens and the Lost Gardens of Heligan in Cornwall are amongst the most popular botanical gardens. The garden at Arundells in Wiltshire, pictured below, is located within Salisbury's beautiful Cathedral Close and is the former home of British Prime Minister Sir Edward Heath. The peaceful garden extends to around two acres in total, with lawns, mature trees, shrubbery and borders. It was redesigned in 1985 to Sir Edward Heath's wishes and much of the garden remains unchanged. Or perhaps you would prefer us to plan a visit to the world-renowned Chelsea Flower Show held each May in England, which could be combined with a tour of superb gardens in England (or further afield). Wales has some of the most spectacular and majestic gardens in Britain. Bodnant, for example, which is situated above the River Conwy in North Wales and boasts fabulous views of the mountains of Snowdonia National Park, is one of the most beautiful. 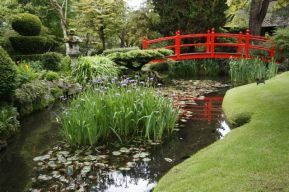 At Bodnant they grow a wide range of interesting and beautiful plants from all over the world, particularly China, North America, Europe and Japan, that are suited to the Welsh climate and soil. Plas Brondanw, designed by Sir Clough Williams-Ellis of Portmeirion fame, is inspired by the gardens of renaissance Italy and the Arts and Crafts movement, and offers a unique insight into early 20th Century garden design seen through the eyes of a creative genius. Visitors to Plas Brondanw will experience a series of dramatic and romantic prospects of the mountains of Snowdonia and the rugged Welsh coast. The celebrated garden at Powis Castle surrounds an imposing medieval stronghold perched high on a rock and offers visitors the chance to explore attractive formal gardens, Italianate terraces, parkland, a deer park and landscaped estate - not to mention the chance to see some of the most magnificent yew hedges imaginable. Plas Tan y Bwlch in Snowdonia occupies a superb position overlooking the valley of the river Dwyryd in the heart of the National Park. The gardens date back to the 19th Century and in spring and early summer are ablaze with rhododendrons and azaleas. 2016 was the 300th anniversary of the birth of the greatest British landscape gardener, Lancelot 'Capability' Brown, and in celebration we designed an eight day tour of his most famous gardens. Please click here to find out more. Ireland is home to some of the world's most beautiful gardens. First planted in 1868, Mount Usher, for example, is one of Ireland’s greatest gardens and a world-class example of a so-called Robinsonian garden, with its relaxed, informal and natural layout. 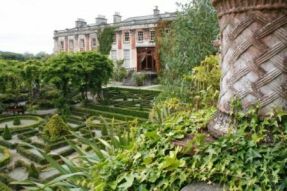 Bantry House and Gardens in County Cork features within its 45 acre grounds a collection of sub tropical plants and shrubs reflecting the best in European design and style. 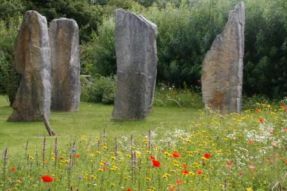 Brigit’s Garden offers a touch of magic in the heart of Ireland’s West, at the gateway to Connemara. Its unique gardens, themed on the old Celtic festivals, bring Irish heritage to life in beautiful surroundings. The Japanese Gardens and St Fiacra’s Garden at the Irish National Stud are part of a unique attraction of outstanding natural beauty that is home to some of the most magnificent horses and sumptuous gardens to be found anywhere in the world. If you would like Janet Redler Travel & Tourism to design a tailor made garden tour for you or your group, please do contact us.